The President’s first post mid-term election news conference was a rowdy spectacle at the White House. It was an 87-minute marathon with almost universally hostile questions from liberal reporters and combative answers from the President. But CNN took the cake for the most unprofessional behavior of all. The entire episode exposed the horrible relationship that exists between the mostly liberal media and President Trump. This type of craziness would have never happened during the Obama presidency. Of course, the media did not ask tough questions to President Obama and gave him the type of respect that President Trump never receives. During the Obama years, the media acted like obedient lap dogs, but, in this administration, they have transformed into rabid attack dogs. At one point in the news conference, Jim Acosta of CNN refused to relinquish the microphone and badgered the President with additional questions. In response, the President called him a “rude, terrible person.” Initially, Acosta asked about the migrant caravan, but when after the President answered the question and tried to call on another reporter, Acosta brought up the Russian investigation and did not allow a White House intern to take the microphone. Acosta’s antics were unprecedented at a presidential news conference. This level of hostility and rudeness has never been seen before at the White House. All sense of media respect for the office of the President is gone, there is now pure hatred. By allowing so many questions and showcasing this behavior to the American people, the President completely exposed the media’s agenda. In previous administrations, real journalists explored the truth from an objective viewpoint, with no political agenda. Today, as documented by respected organizations like the Media Research Center (MRC), there is a blatant anti-Trump bias. According to the latest MRC reports, approximately 95% of the major network news coverage of President Trump has been consistently negative since his inauguration. At Wednesday’s news conference, the antagonism reached a dangerous level. In fact, the Secret Service should have promptly thrown Jim Acosta out of the White House. Fortunately, his press credentials have now been revoked and he should never again be allowed into the White House during the Trump presidency. According to White House Press Secretary Sarah Huckabee Sanders, “President Trump believes in a free press and expects and welcomes tough questions of him and his Administration. 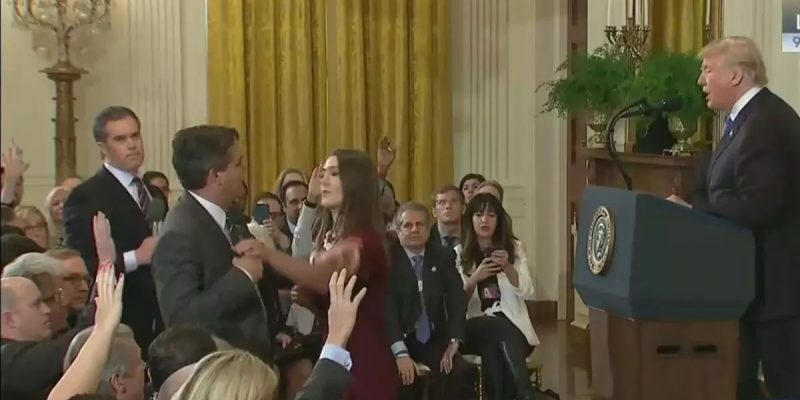 We will, however, never tolerate a reporter placing his hands on a young woman just trying to do her job as a White House intern.” Not only was Acosta’s behavior toward the young intern objectionable, but, similarly, his constant mistreatment of the President and his Press Secretary is completely unacceptable. With such a toxic relationship, it is amazing that the President and Sarah Huckabee Sanders even participate in press conferences and allow themselves to be abused by the liberal and hostile media. One alternative would be to allow selected interviews on a regular basis with fair media outlets and completely ignore the demands of dishonest and biased news networks like CNN. The wild scene at Wednesday’s press conference is not healthy for our country and will only further damage the already low opinion that so many Americans have of the media. Tough questions are appropriate, but it is never suitable for members of the media to become belligerent and hostile toward the President of the United States. A certain level of respect is due to whoever is our nation’s Commander-in-Chief and sits in the Oval Office, whether it is Barack Obama or Donald Trump. Surely, the media offered former President Obama such deference, but it is quite disturbing they refuse to give this President the same level of regard. President Trump earned that type of dignified treatment because he was elected to the highest office in our country. He represents all Americans, whether the media likes it or not. If this type of disgraceful display from the media continues, the President and his Press Secretary should no longer conduct news conferences. What happened this week should never be allowed to happen again.